Named a Wisconsin Academy Fellow in 2004, Michael Fiore is a physician, a professor, and the director of the UW Center for Tobacco Research and Intervention. Here Fiore checks patient Mike Eheler’s carbon monoxide levels. Heeler, a father of four, quit smoking with help from Fiore and the UW–CTRI. Photo credit: UW–Madison Department of Medicine/Clint Thayer. Years later, as an adult, Fiore decided to do something about it. He went to medical school at Northwestern University in Chicago and pursued his internal medicine training at Boston City Hospital. During this time, he convinced his mother to quit smoking, and continually encouraged his Uncle Anthony, a heavy smoker in Boston, to quit, too. Subsequently Fiore earned a Master’s degree in Public Health from Harvard, and worked under former Surgeon General Dr. C. Everett Koop at the Centers for Disease Control. This was in 1988, when Surgeon General Koop released a report revealing that nicotine was as addictive as cocaine or heroin. Taking what he learned from his time with the surgeon general, Fiore came to the University of Wisconsin–Madison to establish a program to help smokers quit. Back in the late 1980s, one out of four Americans still smoked. Bars and restaurants were filled with smoke, as were many workplaces and stores, and even public spaces such as courthouses and hospitals. Few doctors regularly asked their patients if they smoked, and, even if the patient did, there were few resources doctors could draw upon to provide advice and support. There was scant research on how nicotine addiction worked, and nicotine gum was the only medication approved by the U.S. Food and Drug Administration to treat it. “All we had was counseling and gum,” Fiore says with a wry grin. But things would soon change. 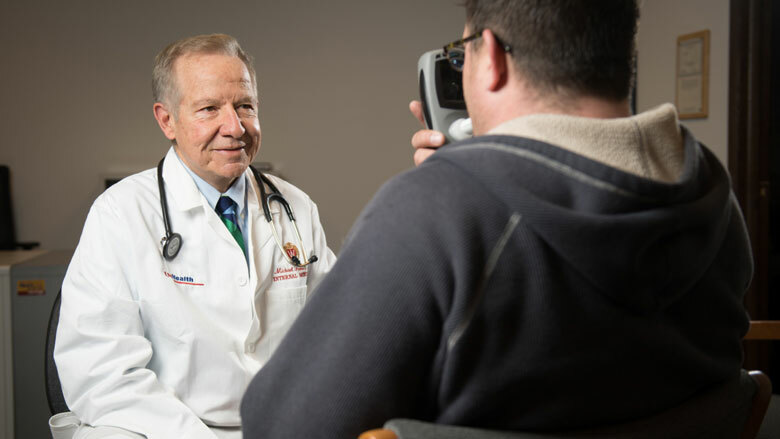 Fiore founded the Smoking Cessation Clinic at the University of Wisconsin Hospital in 1989, and through it met Tim Baker, a noted clinical psychologist and professor in the Department of Psychology at UW–Madison, who was conducting research on addiction. A turning point for the clinic and Fiore and Baker’s partnership came later that year when Fiore received a “K Award” for career development from the National Institutes of Health. With the K Award funds, Fiore explored how to incorporate smoking status as a vital sign for every patient at every healthcare visit, much like respiratory rate and blood pressure. In 1991, the Journal of the American Medical Association published an article by Fiore about how including smoking as a vital sign could dramatically change the way the healthcare system treats tobacco use. “Cigarettes are now responsible for more than 430,000 deaths each year in the United States. As with past epidemics of this magnitude, institutional changes in the practice of medicine must be adopted to overcome the enormous disease burden resulting from tobacco use,” wrote Fiore in what would become a foundational moment in the history of public health. While they were advocating for changes in practice and policy, Fiore and Baker were also running clinical trials of smoking cessation products such as the nicotine patch, which was approved for the treatment of tobacco addiction by the FDA in 1990. Their unique three-legged-stool approach to tobacco addiction—advocacy, clinical trials, and public awareness—caught the attention of then-UW–Madison Chancellor Donna Shalala, who invited them to form an official center. “Dr. Fiore’s center provides the scientific rigor for strong advocacy of smoking cessation,” noted Shalala. In 1992 Fiore and Baker founded the UW Center for Tobacco Research and Intervention (UW-CTRI). During the next quarter century, their work would help people breathe more easily across the globe. In 1996, Fiore served as panel chairman, and Baker as senior scientist, on the first-ever smoking cessation clinical practice guidelines for healthcare providers published by the Agency for Healthcare Policy and Research. The next year, UW-CTRI began clinical trials of another key medication, bupropion (Zyban), and in 2005 would test varenicline (Chantix). These would become two of the now seven FDA-approved medications that have helped thousands of smokers to quit. Today varenicline remains one of the most effective treatments available. By the late 1990s, the public was becoming increasingly aware of the dangers of smoking. In 1998, the attorneys general of 46 states banded together to sue America’s four largest tobacco companies in order to recover the costs of caring for smokers who had developed cigarette-related illnesses. Under what was called the Master Settlement Agreement, the states obtained a 25-year settlement of hundreds of billions of dollars from the tobacco companies, which were also forced to make other concessions (including changes to cigarette advertising) in order to decrease smoking rates in the United States. The following year, the National Institutes of Health awarded a five-year transdisciplinary tobacco use research center grant to UW-CTRI. It was the first in a remarkable string of four consecutive “center grants” that allowed Fiore and Baker to take a long-term look at tobacco addiction and how to treat it. In their studies, the two examined various pharmacotherapies and counseling approaches in numerous comparative effectiveness trials. Their research has not only examined the effectiveness of treatments, but also how quitting smoking affects a person’s physical health, mental health, and quality of life, including social interactions. In addition, Baker has explored the genetics of nicotine dependence and treatment response. In total over the last 25 years, Fiore and Baker were awarded more than $100 million in NIH peer-reviewed grant funding for their pursuit of innovative ways to stop tobacco addiction. Under the leadership of Fiore and Baker, the UW-CTRI published the results of their research in more than 300 scientific articles in peer-reviewed journals, including 27 in the Journals of the American Medical Association and another eight in the New England Journal of Medicine. Fiore gives much of the credit for publication to lead scientist Baker. “He is the consummate scientist: rigorous, insightful, thorough, and clear,” says Fiore. In 2000, Fiore and Baker added a fourth leg to their stool with an outreach program to help healthcare systems incorporate UW-CTRI research into everyday patient care. This approach became a national model for effective tobacco control programs. Today, nearly every patient in Wisconsin is asked about his or her tobacco use status. Recently, this evolved into a National Cancer Institute grant award to collaborate with Wisconsin-based Epic Systems to incorporate tobacco treatment standards into electronic health records. In 2001, UW-CTRI published groundbreaking research showing that tobacco withdrawal persisted in some cases for months after patients had quit smoking, demonstrating the need for providers to follow up with patients long after they’ve quit. Two years later, at the request of then-Health and Human Services Secretary Tommy Thompson, UW-CTRI created a National Action Plan for Tobacco Cessation, which called in part for a nationwide telephone quit line similar to the Wisconsin Tobacco Quit Line they established in 2001. Today, anyone anywhere in America can call 800-QUIT-NOW and get free help to quit smoking. While their work has helped approximately 300,000 smokers to quit in Wisconsin alone, and their research for tobacco treatment is considered the gold standard across the globe, Fiore and Baker in no way feel like their mission is complete. More than 480,000 Americans continue to die every year from smoking—more than the deaths from homicide, suicide, AIDS, illegal drug use, and motor vehicle accidents combined. Tobacco use is still the leading preventable cause of disease and death, killing more than 7,000 Wisconsinites every year. “There’s a saying that goes something like this: When a thousand people die, it is a statistic, but when one person dies, it is a tragedy,” Fiore says. Fiore felt that sense of tragedy on August 26, 2007. Following a Sunday tradition that spanned decades, Fiore telephoned his Uncle Anthony, one of five uncles who helped raise him in Hyde Park, where his large Italian-American family lived. “During that phone call, I asked him about the hoarseness in his voice,” Fiore says. “Uncle Anthony told me it was nothing, but the doctor in me became concerned, and I urged him to have it checked at his local clinic. Uncle Anthony waited almost two weeks; by then he was totally unable to speak. Fiore stresses how the goal of UW-CTRI is “always to come up with ways to translate the research findings into treatments that help smokers quit.” To this end, the center recently has examined electronic cigarettes and is running nine ongoing research studies on tobacco dependence that help many participants break the habit for good. The latest study made statewide news, resulting in more than 2,220 smokers calling to seek help to quit smoking in the first 48 hours. This research will determine whether two highly promising modifications to varenicline treatment—the addition of a nicotine patch and an extended, 24-week treatment period—produce superior outcomes when they are used either together or alone. “I’m so grateful to Tim Baker and our colleagues, collaborators, funders, and all those who have made these advancements possible,” says Fiore. Fiore’s gratitude for these advancements is shared by long-time smokers like Inda Lampkins who tried to quit but found she could not. Lampkins, a Milwaukee resident who was diagnosed with lung cancer, joined one of the UW-CTRI studies because she says she didn’t want to die from smoking and leave her kids without her. Christopher Hollenback is a senior outreach specialist in the Department of Medicine at the University of Wisconsin School of Medicine and Public Health. He has contributed to ESPN: The Magazine, AARP Bulletin, Modern Drummer, the Green Bay Press-Gazette, and Packers.com.